I have a longstanding love for Disney’s Cinderella. As the oldest child in a family with working parents, I always had more responsibilities and chores than my siblings, and at a young age, my granny started calling me Cinderella, and well, I’ve never slept in the cinders next to the fire (unless you count camping under the stars!) or had two ugly step-sisters take over my home (though I do have two daughters, and now I mention it, it rarely looks like my home anymore!) 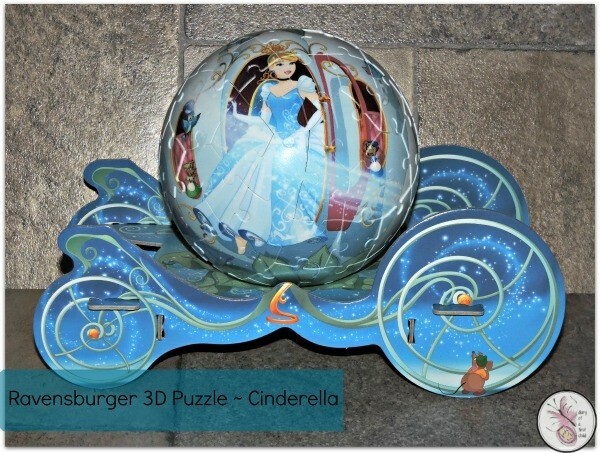 When I was asked if the girls would like to review the Ravensburger Cinderella Puzzle, I said YES! But actually, I was lying. I had no intention of sharing it with them. Personally, I think the Cinderella Carriage looks gorgeous on my windowsill! The Ravensburger puzzle comes in a box with instructions, and 72 puzzle pieces. I was really surprised to find they were plastic puzzle pieces, but in retrospect that makes perfect sense, since they are curved into a ball! In the box there’s also a base for the ‘ball’ to sit on. The puzzle pieces are numbered on the back, which feels like a bit of a cheat at first, but considering the puzzle is meant to be for children and it’s still quite challenging, even with the numbered puzzle pieces, so that’s good. We started off putting the puzzle together just using the numbers, but then realised that actually doing so with the help of the pictures was quite necessary. 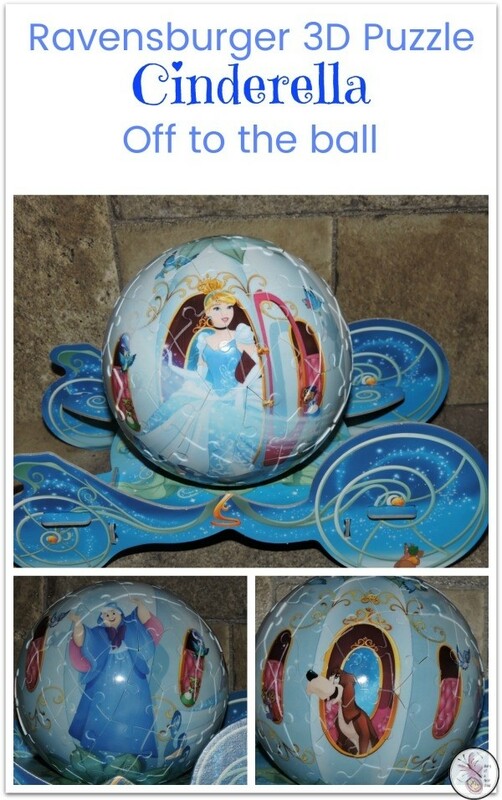 The Cinderella puzzle pieces also have arrows on them, to show you in which direction they go. This might seem odd, but they go in a sphere, so once you’re building it, it all makes sense! I found the hardest part of the puzzle was actually putting the base together (without looking at the instructions) it took us ages! The completed puzzle is beautiful, though the girls wanted to remove part of it so that they could put their dolls inside and use it like a princess carriage for their dolls. 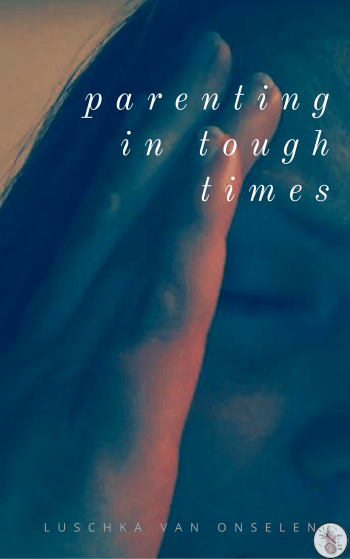 I put a stop to that train of thought as the next thing would be missing puzzle pieces, and as I said – this is my puzzle, target market of children aged 6 – 10 notwithstanding! The only thing that bothered me, just a little bit, about the puzzle was the lack of continuity between the images. Fore example the mouse on one side of the wheel isn’t on the other, but the pumpkin in. The bird on one side isn’t on the other – or visible from the other wheel. 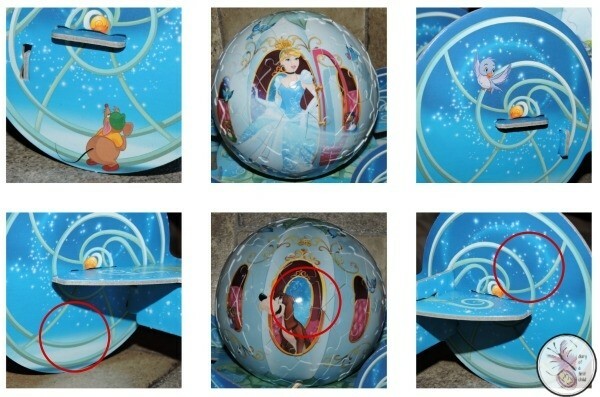 Also, Cinderella is visible outside the carriage on the one side, but on the opposite side there’s a random dog, and you should be able to see Cinderella’s dress from the back through the window, but there’s nothing there. It’s not the end of the world – I only have the Cinderella side visible on my windowsill anyway, but it’s just a point to note. Every now and then my Gran reminds me that Cinderella got to go to the ball, and I will too… I’m not in much of a hurry for Prince Charming, but wouldn’t mind those gorgeous glass slippers, and a ride in this beautiful carriage!